It takes place during the 1912 Factory Strike in Russia. This was the brilliant debut of Sergei Eisenstein which introduced the idea of montage. 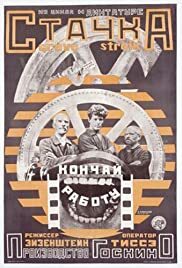 Done before Potemkin, Stachka/Strike(1925) is a film about the struggle of the working class against the Tsar. The film showed of things to come for the career of Eisenstein. This was to be part of a series of films concerning the events that led to the 1917 Revolution. He shows the working class as the main protagonist in Strike. Was co-written by frequent co-writer Grigori Aleksandrov. Stachka and Battleship Potemkin would be the only films in which Eisenstein would have complete artistic control. Like Potemkin, it also features a grand massacre sequence. Eisenstein's direction is nothing short of first class. October(1927) can be looked upon as a sequel to Strike. The images of this is an example of why the silent period was the last truly great era of visual filmmaking. Strike would be the first of many great movies from a master artist. A fine scene is the superimposition of a slaughtered bull over a scene of massacred workers.